Note: Students from Souhegan High School in Amherst, New Hampshire posted some questions for Aquarium researcher Dr. Randi Rotjan in the comments section of this post. Due to Randi's busy dive schedule during the expedition and spotty satellite communications it took a couple days, but she has managed to respond here. My students have been checking the blog everyday--and they are really enjoying following your expedition! They had a couple of questions for you. First of all, wow! It's amazing to be quite literally in the middle of nowhere, and to receive questions and comments from you. It's really nice to have mail, and it's an important reminder of why we're writing these blogs. THANK YOU so much for contributing and for reading! Now, on to your questions. We have talked a little about the North Pacific garbage patch and they want to know if you have seen any evidence of plastics/debris/fishing gear during your time at sea. We haven't run into the North Pacific Garbage Patch (note: for more garbage patch research visit the Seaplex blog), but we have seen lots of evidence of human garbage, mostly in the form of shipwrecks. It's amazing actually--the Phoenix Islands are tiny specks on the map, yet, of the two islands we've seen so far, there have been wrecks on both. How ships manage to end up on these specks of land when they have a huge uninterrupted stretch of ocean is beyond me, but the impact on the islands and the reefs is undeniable. Both above water and below, we have observed wreck debris--one of the expedition members, Stuart Sandin, rescued a bronze fitting from the Norwich City wreck on Nikamororo, which he will use as a pencil holder. photo of flip-flops. So, even in the middle of nowhere, on the world's most remote coral reefs, evidence of human consumption abounds. Is there one specific species that you are looking to investigate? As for what species we are here to investigate, well, each of us is looking at something different. But in general, we're not looking at one particular species--we're looking at as many species as possible to understand how the community, population, and ecosystem have changed over time. Did you always want to be a marine biologist? Have I always wanted to be a marine biologist? Nope! I fell into this career quite by accident. However, a quick survey of my colleagues on this expedition reveals that everyone is different. Les, Stuart and Kate were always destined for science careers, and discovered marine biology along the way. I wanted to be a writer, but fell in love with science in college, and marine biology soon after. So, it just goes to show that there is time to explore your interests and change your career, but keeping an open mind may lead to unexpected possibilities. And one curious student wants to know: Have you ever gone diving in the Giant Ocean Tank at the aquarium? Diving in the Giant Ocean Tank at the New England Aquarium is a wonderful experience--yes, I have done it. Every day, divers at the New England Aquarium go into the GOT to feed the animals and clean the tank and for other purposes. You can read all about it on the divers blog. As a researcher, I dive the GOT to test my equipment, practice new techniques, or to study the exhibit fish. Come visit us at the Aquarium and check out the divers with your own eyes. Again, thanks for the questions, and keep posting comments and questions! It may take me a few days to respond from the middle of nowhere, but no question will be left unanswered. Randi explains more about her work in the "Color-Changing Corals" chapter of the Blue Impact video tour. very cool that you're taking the time to talk to readers! Thanks! I have been reading the blog on a daily basis and I love the picture of you with the sponge. Do you have a policy for touching the corals and sponges and do you think there is an impact? 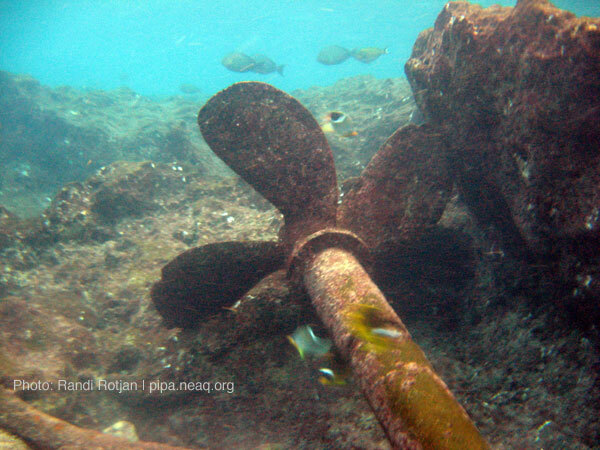 You mentioned that a member of the expedition had salvaged a brass fitting off a wreck; is there a salvage policy? Thanks for reading along. One note on that sponge photo. It's a photo of Randi during a previous expedition to the Caribbean, not the current Phoenix Islands expedition. Hey - thanks for reading. I'm always happy to respond, though there will be a delay. As for touching marine life - excellent question. I generally discourage touching marine life unless you absolutely need to touch it. As scientists, we often need to touch the bottom in order to lay transect lines, examine or collect specimens, or steady ourselves in the surf so that we can work. Though we'd rather avoid touching the benthos, sometimes it's unavoidable. We hope that the tradeoff yields important data, worth the slight disturbance. But in general, I advise against touching anything. In addition to hurting the coral or other animals, many marine organisms have toxins or spicules or spines (including corals and sponges! ), and it hurts! Ouch!